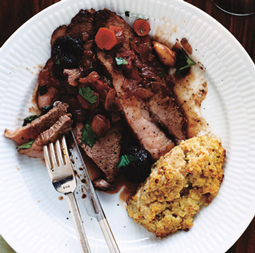 Beef Brisket with Merlot & Prunes - A recipe from Savor California, the online showcase for extraordinary gourmet foods and beverages from California. Photo by Marcus Nilsson Photography. Position rack in bottom third of oven and preheat to 325°F. Pat brisket dry; sprinkle all over with salt and pepper. Heat oil in heavy skillet over high heat. Add brisket and cook until deep brown, about 6 minutes per side. Transfer brisket, fat side up, to large roasting pan or casserole. Distribute onions, carrots, garlic and prunes around brisket. Add other ingredients to skillet. Over low heat, stir and scrape up any browned bits. Pour mixture over brisket. Cover and place in oven. Braise brisket until tender, about 2 hours 15 minutes. Baste twice during cooking. Use a slender metal pin, like a turkey lacer, to check whether the brisket is tender. Insert the pin into the thickest part; if it meets no resistance, the meat is done. Remove brisket from roasting pan, scraping off juices. Cover brisket to keep warm. Place pan juices and vegetables into processor and puree. Return puree to pan and keep warm. Correct seasoning. Serve slices of brisket topped with the sauce.